Container and chassis dwell times in Los Angeles-Long Beach edged lower in December, giving ports, truckers, and shippers hope that the worst congestion since the West Coast labor dispute of 2014-2015 will begin fading in early February. The average container dwell time in Los Angeles-Long Beach in December was 3.31 days, down slightly from 3.51 days in November, but still above the 2.5- to 3-day dwell times that existed during most of 2018, according to the monthly dwell time report published by the Pacific Merchant Shipping Association (PMSA). “Anything over three days creates a barrier to improving efficiency,” said Jessica Alvarenga, PMSA’s manager of government affairs. Loaded containers that spend an excessive amount of time sitting idle at local warehouses and distribution centers before being unloaded are another indicator of port congestion. The container street dwell times have been averaging seven days, versus a normal three to five days, said Gene Seroka, executive director of the Port of Los Angeles. Street dwell times for chassis are also an indicator of congestion because the loaded inbound containers are sitting on chassis, taking them out of service. Street dwell times for the “pool of pools” operated by Direct ChassisLink, Inc. (DCLI), TRAC Intermodal, and Flexi-Van peaked in late 2018 at 7.5 days, said Ron Joseph, executive vice president and chief operating officer of DCLI. The street dwell times declined to 5.25 days two weeks ago, although that is still greater than the 3.5-4 days that is considered normal for street dwells, he said. 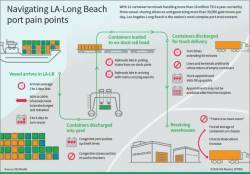 The Trump administration’s threat of 25 percent tariffs on more than $200 million of imports from China, effective Jan. 1, was the main driver of a massive amount of front-loading of spring merchandise through Los Angeles-Long Beach in November and December. Transit times from China are 10 days to two weeks faster to the West Coast than via all-water services to the East Coast, so Southern California was the main gateway for retailers and manufacturers attempting to deliver their imports before the tariffs were scheduled to take effect. The ports experienced record imports for December, with imports increasing 21.6 percent in Los Angeles and 7.9 percent in Long Beach compared with December 2017, according to statistics published on their websites. An industry consultant and former logistics director for a national retailer explained that since retailers didn’t immediately need the spring merchandise, they decided it was cheaper to pay storage charges in Southern California than to wait until after Jan. 1 and pay the 25 percent tariffs. The United States and China have since agreed to delay their tariffs and counter-tariffs until March 1, so the issue remains unresolved. Unless the winter vortex that is descending upon the Midwest and East Coast this week causes a last-minute change in plans, retailers should begin soon to ship their product from the import distribution centers in Southern California, opening space for imported containers to be drayed from the 12 container terminals in Los Angeles-Long Beach to the warehouses, and making room for the final shipments leaving Asia at the weekend before factories close for a week or two for the annual Lunar New Year celebrations. In short, excessive container dwell times at marine terminals and at import distribution facilities destroy productivity. Marine terminal operators say efficiency begins to decline after their facilities reach 80 percent utilization because containers must be handled multiple times before they finally exit the terminal. Operators of warehouses say 90 percent utilization is their maximum capacity before productivity declines. The macroeconomic forecast for 2019 shows the US economy experiencing slower growth this year, although not at a recessionary level, said Paul Bingham, senior economic consultant and contributor to the Global Port Tracker, a report published monthly by Hackett Associates and the National Retail Federation. Slower economic growth plus the front-loading of 2019 spring merchandise in the autumn of 2018 portend low-single-digit year-over-year increases each month in containerized imports from Asia, Bingham said. The latest issue of the Global Port Tracker projects imports in January will decline 0.9 percent from January 2018. Year-over-year imports are also projected to decline 0.9 percent in February, increase 0.6 percent in March and 3.7 percent in April, but decline 1.3 percent in May from the previous year. However, a failure by the United States and China to reach an agreement by March 1 in their trade war, or slowing economic growth in western Europe and China, would be red flags that could diminish US exports to those countries; that could lead to slower economic growth in the United States and slower growth in imports later this year, which would reduce the likelihood of a return to port congestion later in the year, Bingham said.